I have been spending more time sitting at my vice than anything else. Could be worse, but I got to start getting out side and enjoying the snow and ice. There are many things going on as we head into February. Top of the list is the fly tying, of course. I have switched off nymphs and started tying streamers. Yesterday I started in on 3 Rivers Lodge streamers. The last several years I’ve had the privilege to fish with Robin Reeves the owner of 3Rivers Lodge in Labrador. He introduced me to the fly the first year we fished and it has been a staple ever since. 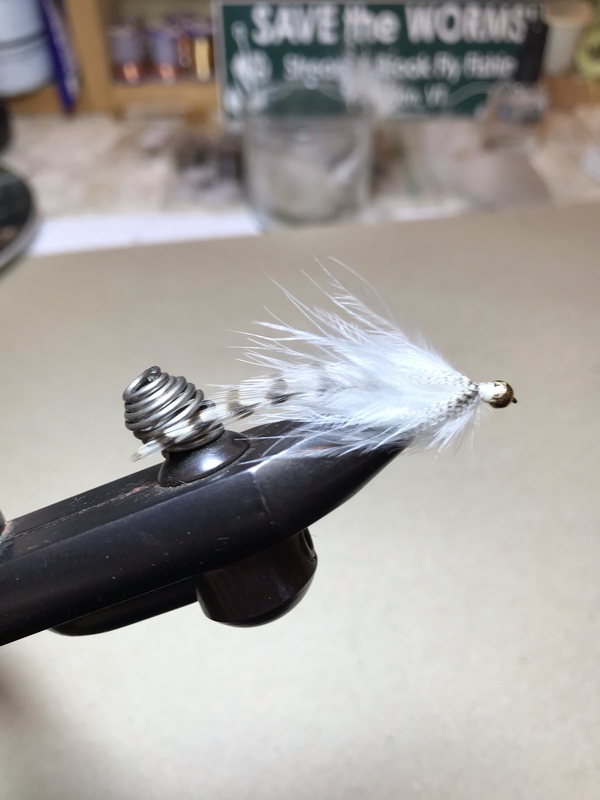 I’ve added a grizzly hackle for a tail and I tie them in different colors. They are very slim in the water and have great movement. I recently got a big order of woolly buggers , so on my home vice I’m back to those. If anyone else needs bugger, now is a good time to contact me so I can keep pumping them out. Now is a good time to contact me with any fly order you have. That will give me plenty of time to get them ready for early season. Mark your calendar for Wednesday February 6th. The Castaway fly tying club will be at Berdas Restaurant and eatery in Essex from 6-8pm. There will be a bunch of different flies being tied by some of the best in the area. If you like good food and drink and like to talk fishing, come join us . There will be flies for sale as well. Remember Valentine’s Day isn’t far away. Many people describe fly fishing as romantic. There is a lot of beauty in the sport. The places that we fish are beautiful and can be secluded. The flies that are used are artistic and make use of soft and colorful feathers and fur. The sounds of the water are intoxicating and relaxing. The grace of the casting motion lures people to the sport. Let’s not forget how stunningly beautiful the fish that you can catch are. This sport is not just for men. There is a big movement of women into the sport and there is plenty of room. My experience with guiding or instructing women has been great. They learn to cast much quicker because they are patient, fluid and naturally graceful. They listen better and generally don’t have any bad habits to brake from growing up spin fishing. 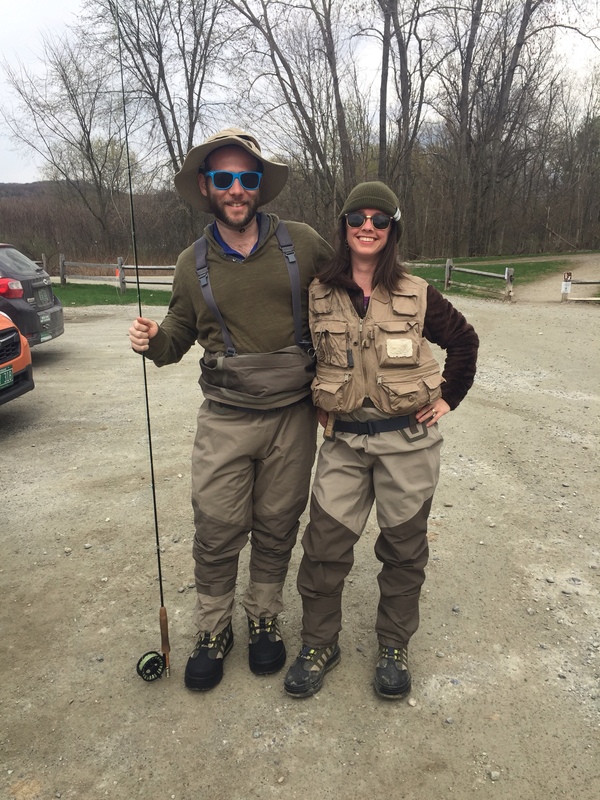 While you trying to get a gift of a guided trip, or an assortment of flies from Stream and Brook for Valentine’s Day, Think about giving your significant loved one the gift of something you love. This is an activity that you can do and can share together for the rest of your lives.